The Pacers fell to the Pistons in their third game of Summer League play after a late rally fell short as Joe Young’s tying layup attempt somehow bounced out, 80-76. Their record is now 1-2. More important than the results of a very entertaining, but meaningless game, a couple of the Pacers young players played very well with challenging matchups. 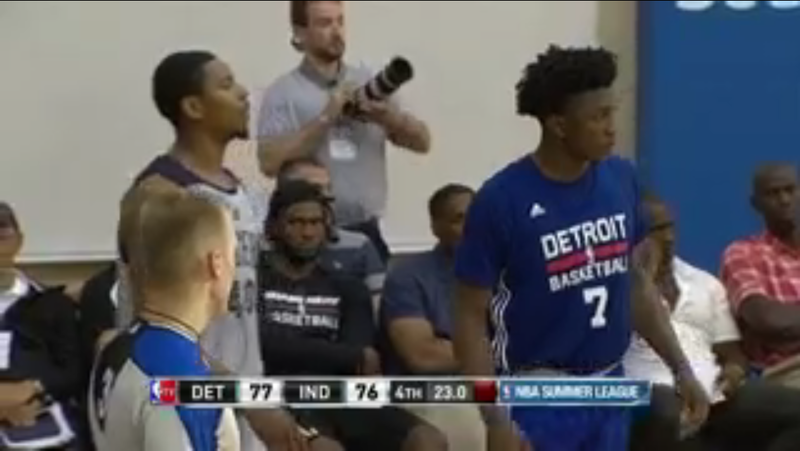 Glenn Robinson III was up against the Pistons previous first-round pick and defensive stalwart Stanley Johnson. GR3 put up 20 points and 7 rebounds, while going back and forth matching bucket for bucket with Johnson in the closing minutes of the game. 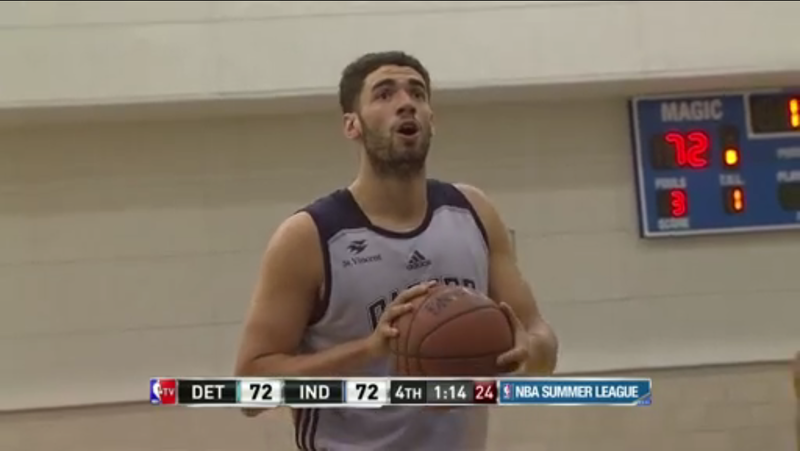 At the same time, Georges Niang, the 50th pick in the draft, went up against Henry Ellenson, who the Pistons picked at 18. Niang put up 14 points, 6 rebounds and 3 assists. I’ll start with Niang, since I know I’ve had a bunch of Iowa State fans interested in how he’s been doing so far (Click on the Georges Niang tag at the bottom to see everything written about him on the site). The broadcasting duo of Vince Carter and Rick Kamla both were gushing over Niang, joining Young, GR3, Popeye Jones and more as members in the Georges Niang Fan Club. Niang seemed to be more aggressive from the start on offense compared to the previous game and got a couple quick baskets in first quarter. While he didn’t make either of his 3-point attempts, Niang made 5 of his 7 shots from inside the arc, showing off more crafty finishes with a couple quick baby hooks and a smooth set shot with hands in his face. Niang did have one bad turnover (2 total), but continued to show his decisiveness when catching a pass and moving it quickly to the next man or attacking the basket. On defense, Niang battled the taller Ellenson, who put up 14 points and 5 rebounds, but made only 4 of 10 shots. Niang did a good job holding his ground when Ellenson tried to post and even forced him farther out to the perimeter a few times. Ellenson is talented and a made a Dirk-esque one-leg fadeaway at one point in the game. Niang wasn’t perfect on that end, losing Ellenson for a couple open threes and fouling him after a late closeout, but overall did very well. The biggest stat in the matchup: Niang was a +5 while on the court, Ellenson was a -4. Niang continues to look like a lock for the regular season roster. Update after completing my journey from Austin Croshereville to Orlando. GR3 came ready to play tonight, scoring the first 8 points for the Pacers with a corner three and two drives to the basket, drawing a foul on the second drive. He came out aggressive on both ends of the court, but never played out of control. Matched up against Johnson, GR3 was dominating the matchup until around 3 minutes were left in the game. At that point, Johnson was struggling making only 3 of 14 shots, including 0 for 5 from deep. Meanwhile, GR3 sat at an efficient 15 points on 6 for 11 shooting. After the Pacers stormed back from down 8 to take a 2-point lead, Johnson hit his first three of the game to take the lead right back. GR3 answered by drawing a foul at the other end while making one of two shots. The two players battled back and forth, matching another couple of buckets before Johnson put the Pistons up for good with another three with around 23 seconds to play. Johnson eventually delivered the knockout punch, but Robinson played the superior game, making 8 of his 13 shots while forcing his opponent to an inefficient 5 of 17. Robinson also did well at defending without fouling (1 personal foul) and taking care of the basketball (1 turnover) which have been issues for the Pacers as a whole in the first two games. Both players earn A performances in Game 3. 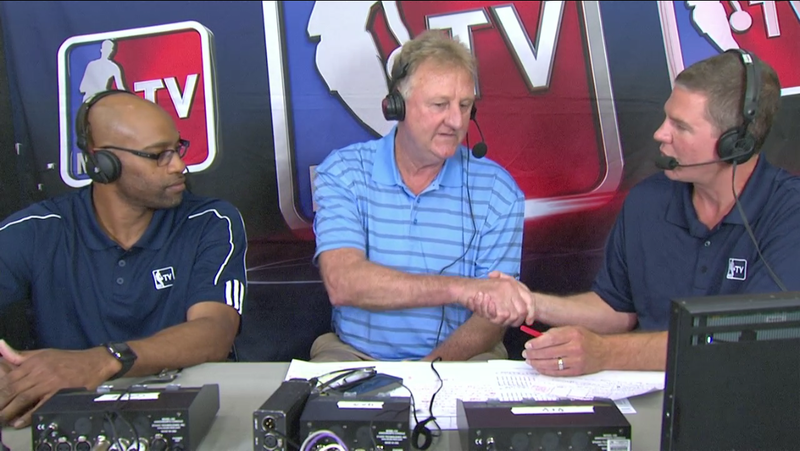 The Pacers play at 5 p.m. again tomorrow.